Master custom motorcycle builder Arlen Ness has done it again in designing the breathtaking 2010 Arlen Ness Signature Victory Vision® Motorcycle. This limited-edition masterpiece comes complete with Ness custom-designed paint, a powerful 106-cubic-inch Freedom® V-Twin Engine with diamond-cut heads, Ness Signature chrome, hand-stitched leather seats, and so much more. For smooth, powerful, eye-catching cruising on Main Street or touring across state lines, the Arlen Ness Signature Victory Vision® provides the ultimate experience. Find out more about its features, specifications, pricing, comparisons, reviews, videos, images, brochures, downloads, and locate your nearest dealer that has the Arlen Ness Signature Victory Vision® Motorcycle. Arlen Likes his windshields low and stealthy, which is the look he has developed here. 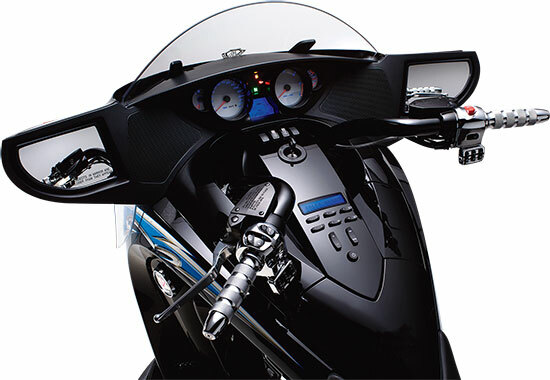 For additional protection while touring, higher accessory windshields are available. The bike features an integrated audio system with an AM/FM radio, and audio can be fed from an accessory MP3 device. The upgraded audio display panel provides details about the music being played. Arlen’s overall custom treatment of the bike extends to the billet Ness custom wheels.